Rice University scientists have created a rechargeable lithium metal battery with three times the capacity of commercial lithium-ion batteries by resolving something that has long stumped researchers: the dendrite problem. The Rice battery stores lithium in a unique anode, a seamless hybrid of graphene and carbon nanotubes. The material first created at Rice in 2012 is essentially a three-dimensional carbon surface that provides abundant area for lithium to inhabit. The anode itself approaches the theoretical maximum for storage of lithium metal while resisting the formation of damaging dendrites or "mossy" deposits. Dendrites have bedeviled attempts to replace lithium-ion with advanced lithium metal batteries that last longer and charge faster. Dendrites are lithium deposits that grow into the battery's electrolyte. If they bridge the anode and cathode and create a short circuit, the battery may fail, catch fire or even explode. 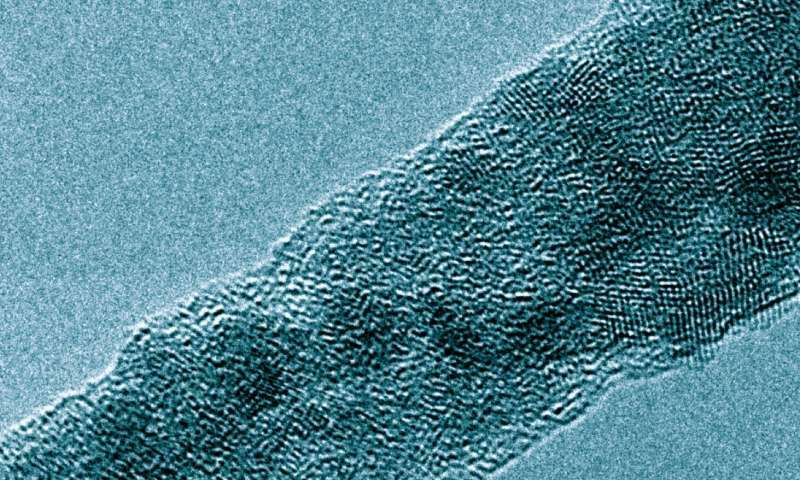 Rice researchers led by chemist James Tour found that when the new batteries are charged, lithium metal evenly coats the highly conductive carbon hybrid in which nanotubes are covalently bonded to the graphene surface. 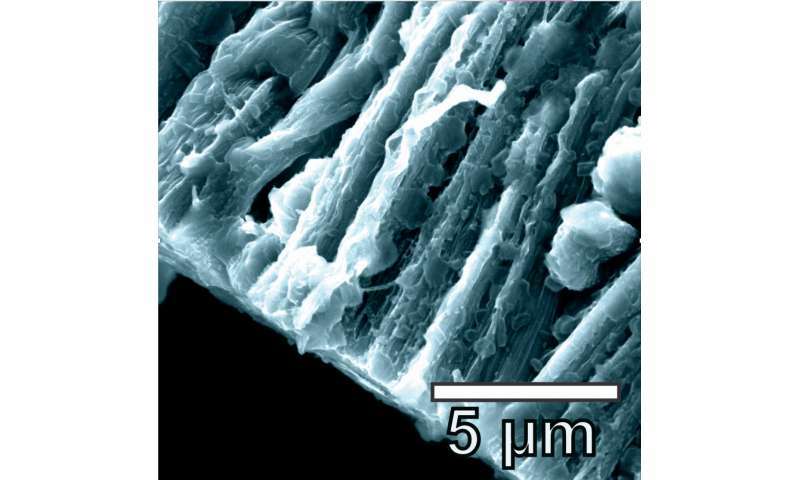 As reported in the American Chemical Society journal ACS Nano, the hybrid replaces graphite anodes in common lithium-ion batteries that trade capacity for safety. "Lithium-ion batteries have changed the world, no doubt," Tour said, "but they're about as good as they're going to get. Your cellphone's battery won't last any longer until new technology comes along." He said the new anode's nanotube forest, with its low density and high surface area, has plenty of space for lithium particles to slip in and out as the battery charges and discharges. The lithium is evenly distributed, spreading out the current carried by ions in the electrolyte and suppressing the growth of dendrites. Though the prototype battery's capacity is limited by the cathode, the anode material achieves a lithium storage capacity of 3,351 milliamp hours per gram, close to the theoretical maximum and 10 times that of lithium-ion batteries, Tour said. Because of the low density of the nanotube carpet, the ability of lithium to coat all the way down to the substrate ensures maximum use of the available volume, he said. The researchers had their "Aha!" 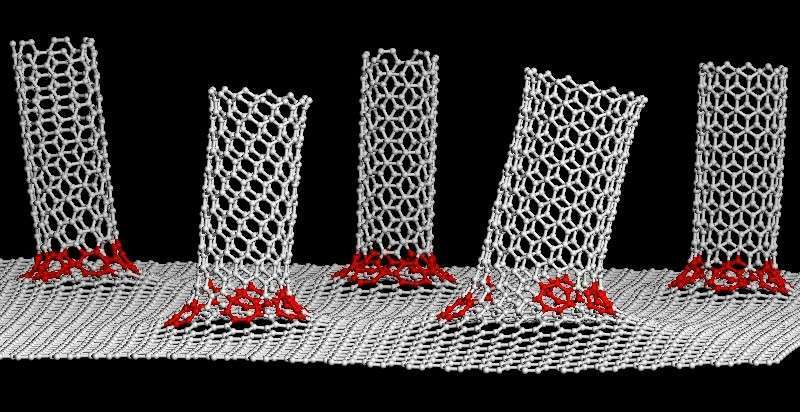 moment in 2014, when co-lead author Abdul-Rahman Raji, a former graduate student in Tour's lab and now a postdoctoral researcher at the University of Cambridge, began experimenting with lithium metal and the graphene-nanotube hybrid. "I reasoned that lithium metal must have plated on the electrode while analyzing results of experiments carried out to store lithium ions in the anode material combined with a lithium cobalt oxide cathode in a full cell," Raji said. "We were excited because the voltage profile of the full cell was very flat. At that moment, we knew we had found something special." Within a week, Raji and co-lead author Rodrigo Villegas Salvatierra, a Rice postdoctoral researcher, deposited lithium metal into a standalone hybrid anode so they could have a closer look with a microscope. "We were stunned to find no dendrites grown, and the rest is history," Raji said. To test the anode, the Rice lab built full batteries with sulfur-based cathodes that retained 80 percent capacity after more than 500 charge-discharge cycles, approximately two years' worth of use for a normal cellphone user, Tour said. Electron microscope images of the anodes after testing showed no sign of dendrites or the moss-like structures that have been observed on flat anodes. To the naked eye, anodes within the quarter-sized batteries were dark when empty of lithium metal and silver when full, the researchers reported. "Many people doing battery research only make the anode, because to do the whole package is much harder," Tour said. "We had to develop a commensurate cathode technology based upon sulfur to accommodate these ultrahigh-capacity lithium anodes in first-generation systems. We're producing these full batteries, cathode plus anode, on a pilot scale, and they're being tested."